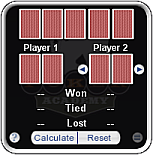 Keeping with Poker Academy’s mission to provide new and innovative ways to improve everyone’s Texas Hold’em poker experience and their chances of winning more often, software developer Graham McEvoy authored a new online gadget called “The Poker Calculator” made available for free via the Google Desktop Toolbar. 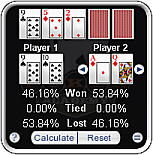 The Texas Hold’em Poker Calculator provides a quick and easy way to calculate poker odds, that is, the chances of a hand winning, tying, or losing. 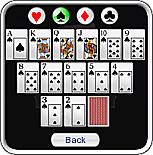 Users simply select a hand and up to nine opponent starting hands and optional board cards. Then click “Calculate” to view how each hand stacks up. Results can be viewed through the main view screen or in a table view to quickly compare all hands. To download the free application, go to http://www.poker-academy.com/poker-odds/. This gadget requires Google Desktop 4 or above. Poker Academy is the leading Texas Holdem poker software developer. Poker Academy develops the world’s most advanced Texas Holdem poker game and training tool, utilizing world renowned artificial intelligence developed over 10 years. Poker Academy software is designed to help players learn, adapt, and improve their poker skills at any level. Poker Academy games include no limit, limit, ring, and tournament play along with many tools to analyze a player’s game. Poker Academy also has an online poker community for players to test their skills against other Poker Academy players. Poker Academy is headquartered in Edmonton, Alberta, and has U.S. offices in Minnetonka, MN. For more details, please visit http://www.poker-academy.com.